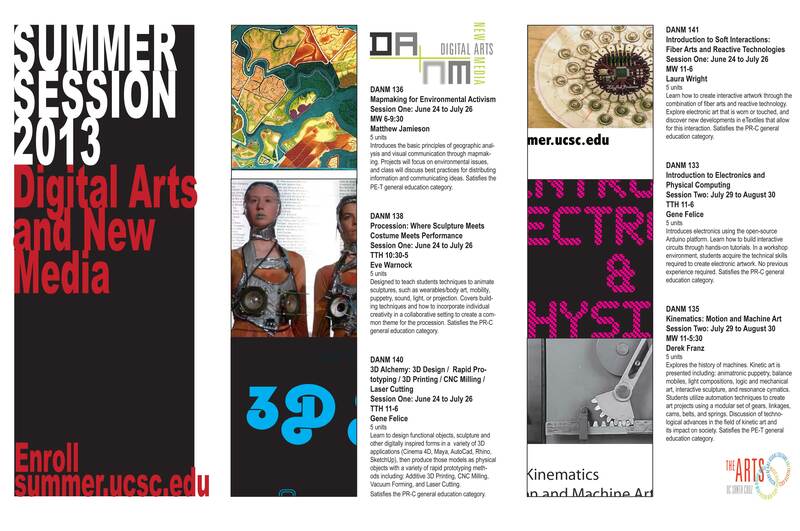 Enrollment is open for the 2013 UCSC Summer Session! DANM is offering six wonderful, informative and fun classes! Several of them are accepted in your major as electives. Just ask danm@ucsc.edu. Introduces the basic principles of geographic analysis and visual communication through mapmaking. Projects will focus on environmental issues, and class will discuss best practices for distributing information and communicating ideas. Satisfies the PE-T general education category. Designed to teach students techniques to animate sculptures, such as wearables/body art, mobility, puppetry, sound, light, or projection. Covers building techniques and how to incorporate individual creativity in a collaborative setting to create a common theme for the procession. Satisfies the PR-C general education category. Learn to design functional objects, sculpture and other digitally inspired forms in a variety of 3D applications (Cinema 4D, Maya, AutoCad, Rhino, SketchUp), then produce those models as physical objects with a variety of rapid prototyping methods including: Additive 3D Printing, CNC Milling, Vacuum Forming, and Laser Cutting. Satisfies the PR-C general education category. Learn how to create interactive artwork through the combination of fiber arts and reactive technology. Explore electronic art that is worn or touched, and discover new developments in eTextiles that allow for this interaction. Satisfies the PR-C general education category. Introduces electronics using the open-source Arduino platform. Learn how to build interactive circuits through hands-on tutorials. In a workshop environment, students acquire the technical skills required to create electronic artwork. No previous experience required. Satisfies the PR-C general education category. Explores the history of machines. Kinetic art is presented including: animatronic puppetry, balance mobiles, light compositions, logic and mechanical art, interactive sculpture, and resonance cymatics. Students utilize automation techniques to create art projects using a modular set of gears, linkages, cams, belts, and springs. Discussion of technological advances in the field of kinetic art and its impact on society. Satisfies the PE-T general education category.